Since the crisis a vast amount of work has gone into ensuring that major cross-border banks are no longer too big to fail. 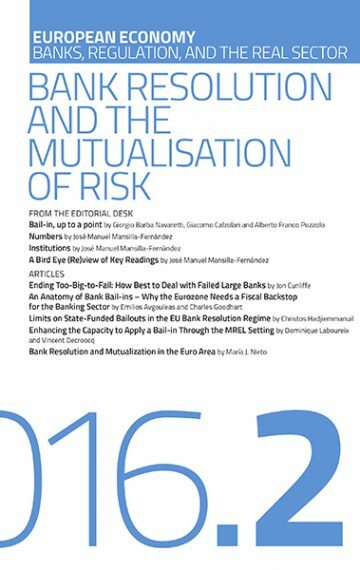 This paper summarises that work, describing progress made in developing resolution regimes and resolvable bank structures in the major banking jurisdictions, in providing incentives to those jurisdictions to cooperate in resolving failed banks and in requiring banks to have enough loss absorbing capacity to ensure that the answer to the question of “who pays?” when a major bank fails is no longer the taxpayer. The paper illustrates these issues by reference to the UK’s recently-published proposals on loss-absorbing capacity, which seek to link the quantum and quality of loss-absorbing capacity to the preferred resolution strategy for each bank. And the paper also emphasises that, notwithstanding the UK’s pending withdrawal from the EU, the UK will continue to cooperate with partners in the EU and elsewhere to ensure that global standards on bank resolution are respected and to promote robust arrangements to deal with the failure of large cross-border banks. Bail-ins could prove an effective way to replace the unpopular bail-outs. In the EU the doom-loop between bank and sovereign indebtedness left governments with a major conundrum. Thus, the EU resolution regime requires the prior participation of bank creditors in meeting the costs of bank recapitalisation before any form of public contribution is made. But, there is a danger of over-reliance on bail-ins. Bail-in regimes will not remove the need for public injection of funds, unless the risk is idiosyncratic. This suggestion raises concerns for banks in the periphery of the euro-area, which present very high levels of non-performing assets, crippling credit growth and economic recovery. To avoid pushing Eurozone banks with high NPL levels into bail-in centred recapitalisations, we have considered the benefits from and legal obstacles to the possible establishment of a euro-wide fund for NPLs that would enjoy an ESM guarantee. Long-term (capped) profit-loss sharing arrangements could bring the operation of the fund as close to a commercial operation as possible. Cleaning up bank balance sheets from NPLs would free up capital for new lending boosting economic recovery in the periphery of the Eurozone. Shortly after the default of Lehman Brothers in 2008 several Irish banks faced acute funding problems. In order to avoid a systemic crisis the Irish government extended a wide-ranging guarantee to its banks. As credit losses mounted in tandem with deteriorating economic conditions, the solvency of the Irish State itself became threatened and eventually compelled Ireland to enter an EU-IMF Programme of Assistance. This paper discusses the alternatives available to European policymakers regarding the regulatory treatment of banks’ sovereign exposures in light of the Irish crisis. Of the various reform options, strict exposure limits seems to be the only regulation that would have materially affected Ireland’s crisis management. However, it is doubtful whether consensus on reform can be achieved. The third leg of European banking union, the common deposit insurance scheme, has been postponed until an unspecified reduction in bank risk has been achieved. A reduction in banks’ domestic sovereign exposure has (mostly rightly) been identified as an objective, potentially via risk-weighting sovereigns. However, risk-weighting sovereigns is the wrong way to go because it both undermines the most fundamental concepts of government and governance (trust), and would build a strongly pro-cyclical element into policy making. There are simpler and better ways to achieve standardised limits on banks’ exposure to sovereigns.